The morning after violent protests at the University of California, Berkeley prompted the cancellation of a speech by a controversial Breitbart editor, the president of the United States took on the school — on Twitter. "If U.C. Berkeley does not allow free speech and practices violence on innocent people with a different point of view - NO FEDERAL FUNDS?" Trump tweeted at 12:13 a.m. ET on Thursday. Trump's tweet caused a firestorm frenzy, ranging from whether the university would actually lose millions of dollars, to the sanctity of the First Amendment. Many noted the irony of Berkeley, Calif. being the birthplace of the Free Speech movement in the 1960s. And yet, it was the progressive campus that was full of armed "Ninja-like agitators" who ended up wreaking havoc on the campus and canceling the speech that was to be made by controversial Breitbart editor Milo Yiannopoulos. Berkeley Mayor Jesse Arreguin lambasted those who tried to mar that tradition. "Using speech to silence and promote bigotry is unacceptable. Hate speech isn't welcome in our community," he tweeted. But, in a second tweet, he wrote: "Violence and destruction is not the answer." Cal student Juliana Mora agreed: "We don't stand for that. We don't want to get mixed up with the few bad apples. This is the home of free speech." The free speech movement was forged at UC Berkeley in the 1960s. Bettina Apthekar, among those in the thick of it, was targeted for organizing a peaceful protest against the Nazi party on campus. "Their signs said, ‘Burn Aptheker,’” she recalled. But Aptheker supported the opposing side’s First Amendment rights, and said the university did the right thing by not standing in the way of college Republicans who wanted to invite Yiannapoulos. “We have to hold on to” the principle behind the freedom of speech and expression, she said. “It's too much of a slippery slope once you say this person can't speak." A generation later, David Sabes was a UC Berkeley student faced with a similar dilemma. He said the university should be a venue for different perspectives and peaceful protests. A recording of Yiannopoulos’ speech might have been a more powerful vehicle for the polarizing figure’s critics, he said. “That moment could have been caught and those would have been the videos that would be viral right now, as opposed to the videos of innocent individuals being attacked,” Sabes mused. As for Trump's veiled threat, UC Berkeley relies heavily on federal funds. In 2015-2016, for example, the university received $370 million in federal funds for reseach grants alone, 55 percent of the overall research funding budget. And according to the National Center for Education Statistics, Cal receives another $76 million in student aid from the federal government ($38 million in Pell Grants and $38 million in federal student loans). California Lt. Gov. Gavin Newsom weighed in on the money issue. Just before 8 a.m. on Thursday, he tweeted: "As a UC Regent, I'm appalled at your willingness to deprive over 38,000 students access to an education because of the actions of a few." When Trump spoke later Thursday morning at the National Prayer Breakfast, however, he was silent about what happened at Cal. Instead, he chose to trash California's former governor, Arnold Schwarzenegger, over poor TV ratings. Cal Chancellor Nicholas Dirks also pointed out that out of a crowd of 1,500, only about 100 or so agitators, whom he said did not attend the school and were armed and masked like "Ninja warriors," created the problem. Though he had written an open letter last Friday saying he thought Yiannopoulos was a "troll" and "provocateur," who many feel is racist and misogynistic, Dirks also said that the Berkeley College Republicans had every right to invite him to speak. For his part, Yiannopoulos, who is gay, has rejected accusations that he is a white supremacist, saying his boyfriend is black, and his humor is taken too literally in today's politically correct culture. After the cancellation of the event, the 32-year-old editor took to Facebook to make his voice heard. "One thing we do know for sure: the Left is absolutely terrified of free speech and will do literally anything to shut it down," he wrote. "Don't give up. They cannot win. They will not win," he wrote in another post. He also posted several Breitbart news accounts of a women getting hit by "violent leftists" and a piece by Breitbart author Tom Ciccotta, called "The Night Berkeley Betrayed the Free Speech Movement." During the ruckus, Berkeley police said "three or four" people were injured. However, several social media accounts showed possibly many more being injured. Trump supporter Kiara Robles, for example, was pepper sprayed, as she was getting interviewed. "Look at the people causing the violence, it's not the people in the red hats," she told NBC Bay Area. The evening got ugly long before dark. Campus police canceled the event at 6 p.m. Wednesday, two hours before Yiannopoulos was set to speak. 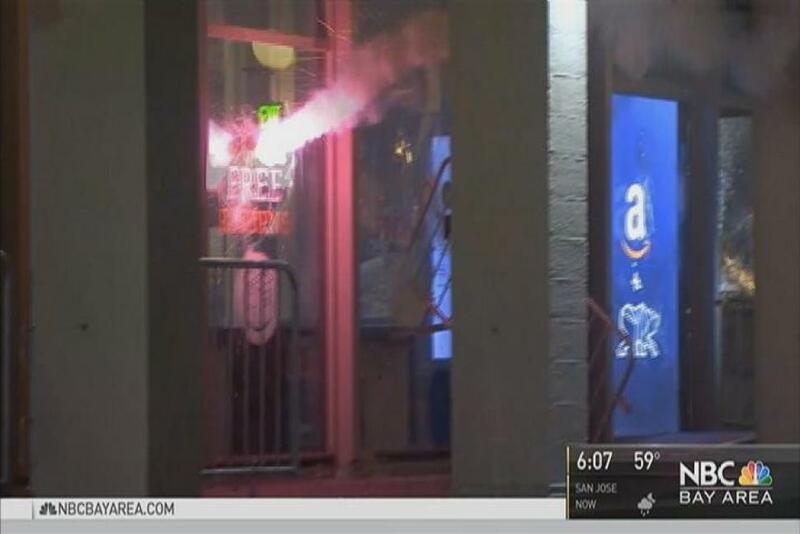 That's because fires were deliberately set, one outside the campus Amazon outlet; Molotov cocktails that caused generator-powered spotlights caught fire; commercial-grade fireworks were hurled at police officers; and barricades were pushed into windows, the university detailed. And on Thursday morning, many people wanted to make things right again. UC Berkeley police said they had made just one arrest, and a "Clean Up Berkeley" Facebook page was set up. 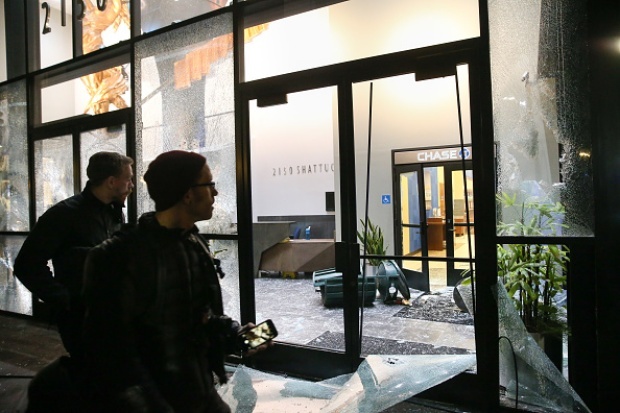 "The violent protests...do not represent UC Berkeley," the invitation read. Many said they were really ashamed of the damage that was wreaked on their campus. Leading up to his visit, Yiannopoulos raised an issue facing campuses across America at the dawn of the Donald Trump presidency: What is the line between free speech and hate speech? 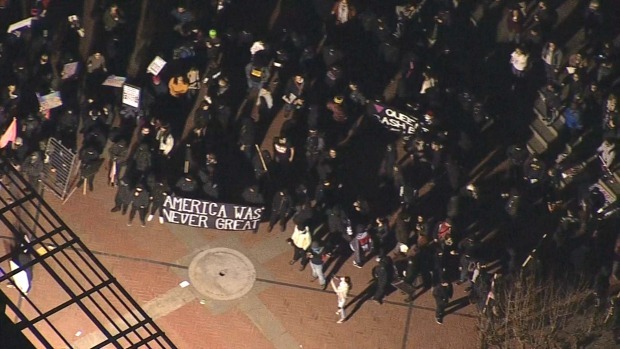 The potential for physical danger in reaction to Yiannopoulos came into the spotlight this month after a man was shot and wounded at a protest outside his Jan. 21 University of Washington talk. Similarly rowdy protests at UC Davis Jan. 13 prompted campus Republicans to cancel his appearance at the last minute. On Tuesday night at Cal Poly San Luis Obispo, his speech was met with dozens of angry protesters outside a campus theater, but they were outnumbered by police who kept them far from the nearly 500 attendees and the event went on as planned. His last stop was supposed to be UCLA on Feb. 2, but that invitation was rescinded, making Berkeley the grand finale of his cross-country campus tour. The morning after violent protests at the University of California, Berkeley prompted the cancellation of a speech by a controversial Breitbart editor, the president of the United States took on the school — on Twitter. Bob Redell and Edward Lawrence reports. NBC Bay Area's Rachel Witte, Cheryl Hurd and the Associated Press contributed to this report.